We're opening the doors for our hugely popular semiannual warehouse sale once again! This year we'll have extended hours and two consecutive weekends, kicking the first weekend off on Friday afternoon. Come explore thousands of remainders—fiction, cookbooks, children's books, comics, art, history, science—plus rare and unusual used books just waiting to be discovered. What are remainders, you ask? They are bargain books, new books at dramatically discounted prices. Remainders at Harvard Book Store are typically 40-80% off the original list price. Tweet or Instagram your favorite finds using #HBSWarehouseSale this weekend, and we'll pick one winner from each day to receive a $25 Harvard Book Store gift card. Follow us on Twitter at @HarvardBooks and Instagram at @harvardbookstore. Drop off your email address on your way out for a chance to win a $100 gift card to Harvard Book Store when you fill out a quick online survey. 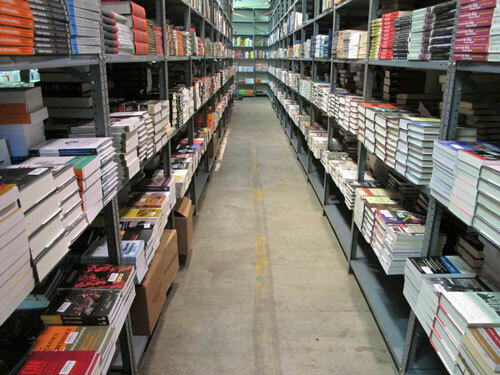 For every $50 you spend in a single visit to the Warehouse Sale, earn a coupon for 20% off a purchase at Harvard Book Store in Harvard Square.